- People are fleeing their villages for a safer area when heavy rains are raging over Yunnan. 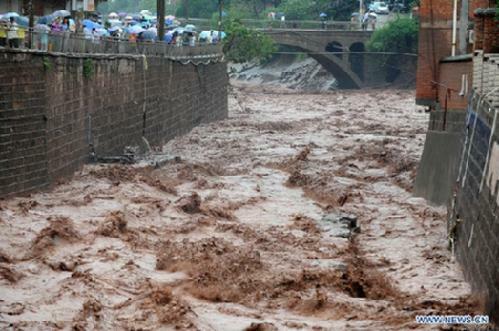 China.org writes : A heavy downpour has hit southwest China's earthquake-hit county of Yiliang early Tuesday morning, triggering floods to cut off roads and force thousands to evacuate. The county's headquarter of flood control and drought relief said the rainfall is the largest in local meteorological history. It has damaged the county's drinking water supply pipeline and an alternative water source. The flood is set to delay the post-quake relief work as all roads linking the county with elsewhere have been cut off. CCTV journalist at work in Yunnan's Jiliang area are witnessing the heavy rains which are generating mudslides. We truly feel sorry for all these earthquake victims who have to find refuge in tented camps with this kind of weather. We expect further video later today and will bring it to you when we notice it. 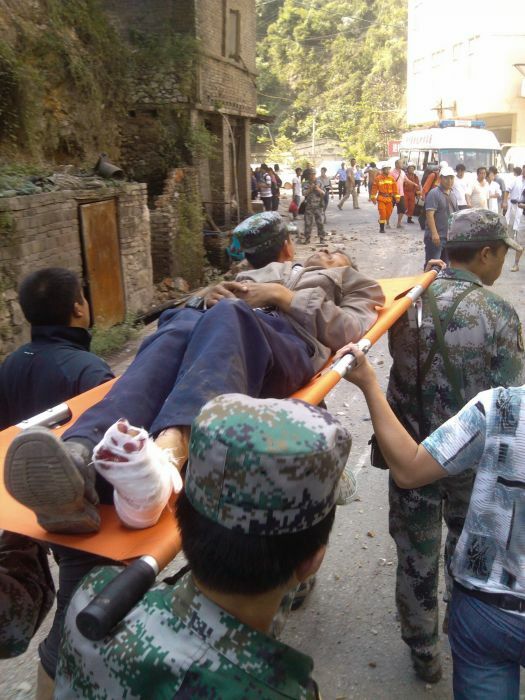 2 moderate but nevertheless dangerous earthquakes occurred in another part of Yunnan. As the main reason for the damage from lastweek's earthquakes was landslides, it will certainly also be the case here. Early reports are talking about 2 people injured. We are following up the aftermath of these new shakes and will report accordingly. The earthquakes in Yiliang county have caused 257 schools to become damaged containing 98,000 students. Direct economic losses of up to 582.26 million yuan or around 90 million USD have occurred with schools needing at least 270 million yuan of funds. More than 200,000 children are estimated to have been affected by a 5.7 magnitude earthquake in the South - Western provinces of Yunnan and Guizhou in China. “Children who have survived this will be frightened and exhausted. We are especially worried about children who may have been separated from their parents during the earthquake, as more aftershocks are expected to hit the area,” said Pia MacRae, country director for Save the Children in China. Save the Children has been working in China for nearly 25 years, responding to over 15 disasters in that time, such as the 2010 Yushu earthquake and 2008 Sichuan earthquake. - The direct economic loss estimate from China has hit 3.704 billion CNY or 587 million USD. This is equivalent to 10% of the GDP of the Zhaotong City Prefecture. - The death toll has reduced again after double counting to 81. Injuries are up to 820. 744000 people have been affected. (彝良县洛泽河镇 - 62 people、角奎镇 - 11 people、龙街乡 - 3 people、荞山乡 - 2 people、龙安乡 - 1 person，昭阳区北闸镇 - 1 person、青岗岭乡 - 1 person. - In Yunnan, 6650 rooms have been destroyed and over 122000 rooms damaged with 201000 people relocated while emergency forces work. - In Guizhou, 3 rooms collapsed and 100 rooms have been severely damaged with 380 people relocated. - Rumors are again increasing misery levels as mouth to mouth information tells them about new earthquakes to arrive soon. Over and over again we have to explain that the strength and timing of earthquakes cannot be fore-casted. All people can do it being prepared to withstand another one. Very rare cases are generating aftershocks that are equal or even stronger than the previous mainshock, but very few chance still means that the chance exists. NEVER believe prophets and continue listening to skilled science people. - 43 bodies have been returned to the relatives for burial. The names of these people will be published soon. - After the quake, local authorities have built several temporary shelters at the county square and the county hospital. Relief materials are also arriving. Rescue teams are working around the clock to reach survivors. - Troops are reporting that rocks are still tumbling down the slopes and mountains which makes repair work very dangerous. - A lot of Chinese citizens have started to donate money to the Chinese Red Cross. The fund will help to cover urgent needs and medium term aid. - A baby was born in a rescue tent ! A lot of misery and at the same time a sign of hope ! - The direct economic loss estimate from China has hit 3.5 billion CNY or 551 million USD. - This is equivalent to 10% of the GDP of the Zhaotong City Prefecture. - The death toll has unfortunately risen to 89. Injuries are up to 795. 744000 people have been affected. - The new number of fatalities makes today's earthquake the second deadliest in 2012. Coincidence or not, both these earthquakes were double earthquakes. - The city of Chongqing (+30 million inhabitants) has offered to help. Chongqing is approx. 300 km from the epicenter. - It is horrifying for us to add always more and more fatalities in our updates. Now from 63 to 64, another family devastated by losing someone. - A reporter who was inspecting the area saw huge landslides on both sides of the valley. - Roads are being blocked by huge rocks. - Experts from CEA (National Earthquake Authority) will arrive soon at the scene to help with the local authorities. National experts are only sent in after major earthquake events. - Darkness will set in in a couple of hours making rescue work even more dangerous. Rescuers still have to cope with aftershocks of M3 to M4. - The death toll of the double M5.6 / M5.7 earthquake has further climbed to 43 (42 in Yiliang County, 1 in Zhaoyang District). - 24 dead, 150 injured. - ER expects that the Economic loss estimate is coming out to $220-390 million based on the current parameters. (still waiting on a damage-based estimate). - The Chinese CEA authority has send a 10-man supervisory team to the area. These National teams are only flying in in major disaster cases. - The news of serious landslides also means that remotely located villages may have been hit by landslides too. Priority is mostly given to the bigger cities. - Greatly seen in the world as small tremors proof once more to become a deadly cocktail in China. Earthquakes cannot be pinned into a Magnitude / Dangerous relation. Much more has to be accounted for. - Death toll has reached 7. - In addition, 20000 households have damage of some form. - At least 6 are dead according to new reports. The M5.7 earthquake had a 14km depth, and was 15km from Yiliang county and 30 kilometers from Zhaotong City. Damage is expected in both locations. Zhaotong Prefecture is home to 5.74 million people but has a reasonably low GDP of around CNY39 billion per year (6.2 billion USD). It is mainly agricultural in nature. The exposed capital stock according to CATDAT in terms of net capital infrastructure is around 14.2 billion USD, of which around 2.1 billion USD is in the most affected areas including Yiliang County. Hence we are looking at a damage bill in at least the 100s of millions of USD if directly impacted. The rural net capita income is about CNY2900 (around 500USD). UPDATE:- At least 20,000 rooms (around 6,000 houses) are destroyed at first estimates, with 6000 tents being sent to the region and many other disaster supplies. Epicenter right by the city. UPDATE:- The dual quakes hit about 57 minutes apart, both of around M5.6, with much panic. Over 6.7 million people live within 100km of this quake. Yiliang county itself has around 500,000 inhabitants and is extremely mountainous having differences of 520m above sea level to 2800m within the county. 51 minutes after the event, 39 people were sent to the area from the Seismological Bureau. According to Yunnan Yiliang radio and television reporter sent to CCTV's news, a 5.6 earthquake occurred in Yunnan Yiliang, some houses have collapsed and landslides hindered transportation. UTC Time : 03:19:42 UTC, Friday, 7th September, 2012. Local time at epicenter : 11:19:42, Friday, 7th September, 2012. Many parts of south-eastern China have a history of damaging earthquakes, and the area surrounding the September 7th, 2012 earthquakes is no exception. 30 earthquakes of M5 or above have occurred within 100 km of these events over the past 40 years. Three had magnitudes greater than 5.5, and each of these caused damage and fatalities. The largest, a M 6.8 earthquake 80 km to the north of the September 7th events in May 1974, caused over 1500 fatalities. A M 5.6 earthquake just 30 km to the south of these events also caused several fatalities in November 2003. While the September 7th, 2012 events are not considered large earthquakes, the high population density and high vulnerability of structures in the region make such shallow earthquakes particularly damaging. It appears the Chinese Government does not have seismic quality control over the type & nature of construction works in rural areas but the question is why ? It is like believe it or not as there are top level seismic structural engineers practicing in China.This will not be wrong if I say it is an irony of fate. I request the Government of China to explain. Earthquake Resistant Building Construction Code (ERBCC) be strictly enforced in rural areas and Seismic Construction Monitoring Agency (SCMA) based on this code be set up by the Government of China to prevent this sort of disaster as prevention is better than cure. With this much regards & best wishes.